Today I have the great pleasure of having award-winning, bestselling author of Regency, Georgian and Medieval romances; Regan Walker visit Chicks, Rogue’s and Scandals. As well as chatting about her work Regan is very generously giving away two copies of her book; The Holly and the Thistle. But, firstly lets get to know Regan. A former lawyer turned writer, Regan Walker is an award-winning, bestselling author of Regency, Georgian and Medieval romances. Her novels weave history and historical figures into fictional stories with political intrigue, a bit of mystery and love. She lives in San Diego and loves to take long walks looking out at the ocean. I write novels with real history and real historic figures and a wonderful happy ever after ending. I want my readers to experience real historical events as well as adventure and love. For each of my novels, I do hundreds of hours of research to “get it right”. Frankie Hi Regan, Welcome to Chicks, Rogues and Scandals! Thank you for taking the time to chat with me today. Firstly what five word’s would you use to describe yourself? Regan Oooo, hard question. The words my friends have told me describe my character would be “independent, courageous, loyal, honest (to a fault) and compassionate.” But in fairness, I am also sensitive to criticism, demanding (of myself and others) and a perfectionist. Regan Well, I’ve travelled to 40 countries and while there are some I love and want to return to (Scotland comes to mind), I wouldn’t want to call any place home but America. I am very proud to be an American and I love my country. I think if I were to live in another era, it would be America after the Revolutionary War in Williamsburg, Virginia when the country was in its youth and excited about what lay ahead. Exploring the West in the late 19th century also appeals. But if I were to live in modern times, my preference would be for the Pacific Coast, as I love the ocean and the sea breeze. Frankie Who was your childhood hero? Regan I grew up without a father and it wasn’t until I was in high school that I discovered my other hero, Winston Churchill. For most of my life, and to this day, my hero has always been God. Frankie What is your favourite time of the year? Regan It depends on where I am, but generally it’s autumn. October is nice the world over. Spring is a close second. And if we’re talking the Rockies or the Pacific Northwest, it has to be summer. 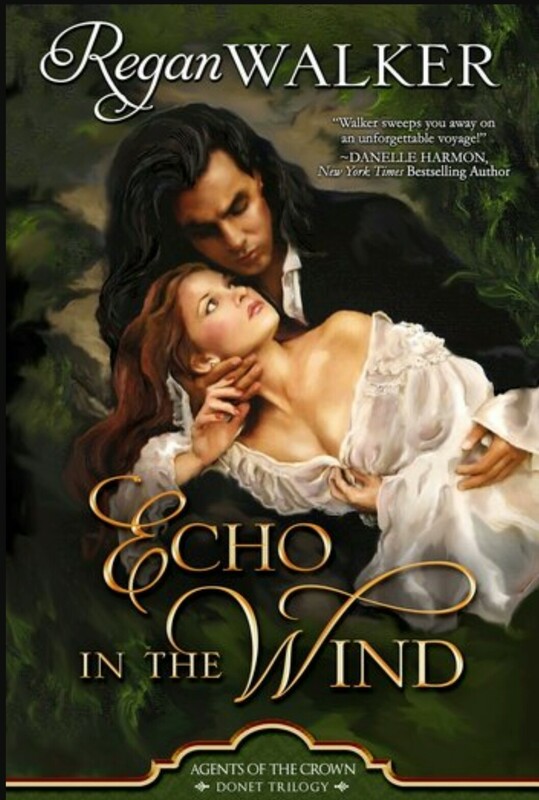 Regan Not until I wrote Echo in the Wind could I answer that question. Now I know it’s Jean Donet, comte de Saintonge, former pirate, privateer, smuggler and spy. A widower who never thought to love again. He is introduced in To Tame the Wind, but he doesn’t find his soul mate until Echo in the Wind. Frankie Where does your inspiration for your books come from? Regan The characters (mostly). A character pops into my mind and then I go looking for history in which to set him/her. Sometimes the history leads me, but generally I begin with a character. In my new novel, A Secret Scottish Christmas, it was Aileen Stephen, the only daughter of an Aberdeen shipbuilding family who, as a child, developed a passion to design ships. If you were to ask her if she would ever fall for an Englishman she would have showed you the door. Frankie What three tips would you pass on to an aspiring author? Regan Read what you love, write what you love and finish the book. Frankie If you were hosting a dinner party what three people would you invite? Regan J.R.R. Tolkien, Abraham Lincoln and Margaret, Queen of Scots (11th century). I admire them all. My tastes in people are pretty eclectic. Now, if you’d given me 20 names, I could really have a party. Frankie Thank you for taking the time out of your busy schedule to chat with me today, Regan. I have just one more cheeky question, just for fun . . . What is your all-time favourite naughty but nice food? Regan Flourless chocolate cake with whipped cream and a glass of Rosa Regale (the wine made for chocolate). It’s my Valentine’s Day default dessert. That sound’s delicious, thank you so much. On Amazon / See the Pinterest Story Board! Regan is so very generously giving away two copies of her Seasonal story; The Holly and the Thistle. To be in for a chance of winning a copy of this great book then just leave a comment on this post or on the Giveaway Post on my Facebook page HERE. *Open internationally, all comments from this post and Facebook will be combined and two winners will be drawn at random. Giveaway closes on 20th November at Midnight GMT. Winners will be announced shortly after. This entry was posted in Exclusives, Give Aways, Historical Romance, Interviews, Spotlight and tagged A Secret Scottish Christmas, Agents of the Crown, Author Interview, Book Giveaway, Interview Exclusive, Regan Walker, Spotlight, The Holly and the Thistle. Thanks for having me on your blog, Frankie! And for the great interview questions. I am honored to be here! It’s a pleasure to have you on my blog today,Regan. Your welcome anytime, thank you for participating. An excellent interview, I learn more and more about my favorite authors from your interviews. Thanks for stopping by, Tommie. Glad you liked the interview. Frankie asks great questions!